Half ounce vials, each comes with three charcoal briquettes. 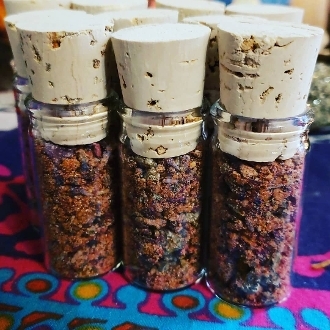 This incense is created with only the finest resins and herbs; dragon's blood, benzoin, lavender resin, lavender buds, orris root powder, amber resin, gardenia resin, jasmine resin, tonka bean and more. Created to release relationship fears adnd traumas, promote healing, ignite healthy relationships and promote renewal in romantic energies.